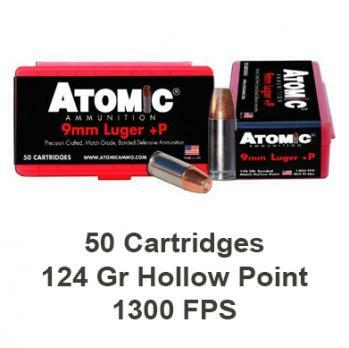 Atomic’s 9mm +P ammunition is designed to hit hard, penetrate deep and shed petals during expansion. The loss of petals allows for additional wound paths increasing the likelihood of striking a nearby blood vessel, organ or central nervous system all while reducing the core weight to protect against the danger of over-penetration. The central core should expand to 150% of the original diameter, retain 75% or more of the projectile’s weight and penetrate not less than 12 inches of ballistic medium. Due to the unusual shortage of ammunition components and difficulty in obtaining new, PLUS P (+P) marked cartridge cases, some +P(+P) ammunition may be loaded in NEW standard cases.